When seventeen-year-old Amanda Christie is invited to a cousins-only weekend retreat at her aunt's estate in Austin, Texas, she doesn't know what to expect. But she soon finds that the weekend will be anything but boring. One of the guests is responsible for the death of Amanda's uncle, and when a dangerous storm traps the teens inside the secluded mansion, Amanda becomes determined to uncover the killer. But when their cell phones go missing and guests begin to disappear, Amanda realizes that the killer isn't finished. With time running out and no way of knowing who to trust, she must either uncover the murderer... or risk being the next victim. This book is scheduled to be published August 1, 2009 and is intended for Young Adults. As I read the first chapter, written by Bren Gaudet I felt like this book was going to be another predictable teen crime story. As the story unfolded, there were enough doubts thrown into the plot by the author to keep me guessing. This is an enjoyable read with one slight flaw. The main character is not fully developed. At one point I felt like the author made an assumption about the audience knowing the career aspirations of Amanda. 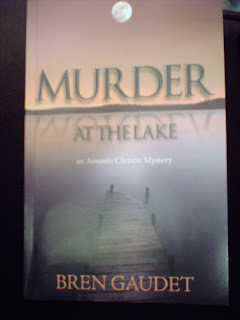 By the time Gaudet mentioned Amanda wanted to be a crime scene photographer; it felt too late. This should not detract most of the intended audience. This book is the first in a series for the character of Amanda Christie. According to the author's website (www.bengaudet.com) future stories will include Amanda's best friend and boyfriend as she travels to exotic locations to solve mysteries.